Living an hour outside of Paris in the renown city of Orléans, Gérard Chesneau is a photographer whose main occupation is as publicist for a local newspaper. He's been shooting for over thirty years (but still considers it a hobby). 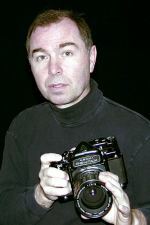 He works with a variety of different camera types including medium format and digital and creates his images through traditional as well as computer-based methods.